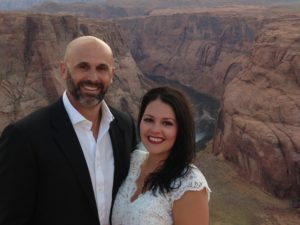 As a Sedona wedding officiant, I mostly get to officiate weddings in my home town. 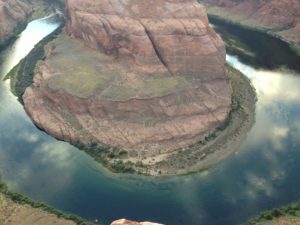 So, when I got a request to officiate a wedding at Horseshoe Bend, I was excited! I’d never seen this amazing natural wonder, and so it was a great opportunity to do my job and experience a wonderful place. Sunny and Clint had driven all the way from their home in Alabama to get married here, high above the Colorado river. 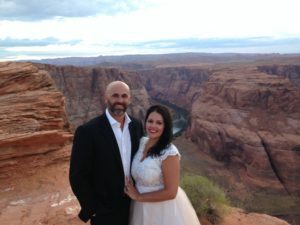 We held the ceremony just before sunset, and the views were literally breathtaking — from the distant vistas lit by the setting sun, to the blue-green waters of the Colorado a thousand feet below, us, to the towering red rock that creates the famous bend in the river. My wife Kate came along to act as a witness, and take some pictures. Clint and Sunny are super nice people, and it was a wonderful experience for us. I love my job!